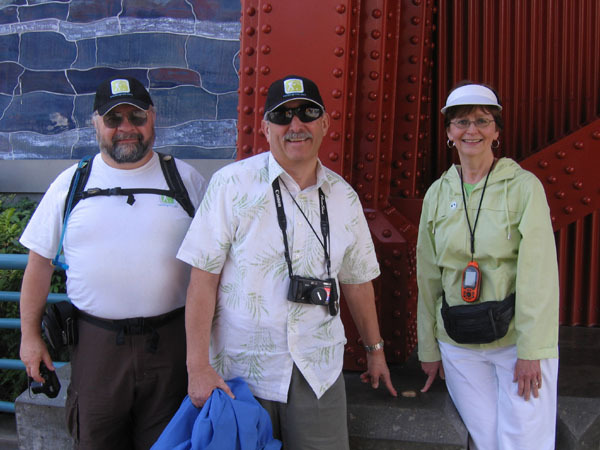 As with my March, 2007 trip, this one was prompted by an upcoming visit to Southern California by my friends Rhonda and Bill Rushing, who live in Wisconsin. They run Berntsen International, the company that makes the Disney survey marks I enjoy so much. Our local friend Larry Klementowski would also be joining us. I flew Southwest and ended up in the second row, just behind a family that was about to take a cruise to celebrate the grandparents' 50th anniversary. One of Southwest's clever flight attendants made this bridal tiara for the woman. (The recipient promised--or perhaps threatened--to have her husband wear it at the cruise terminal.) 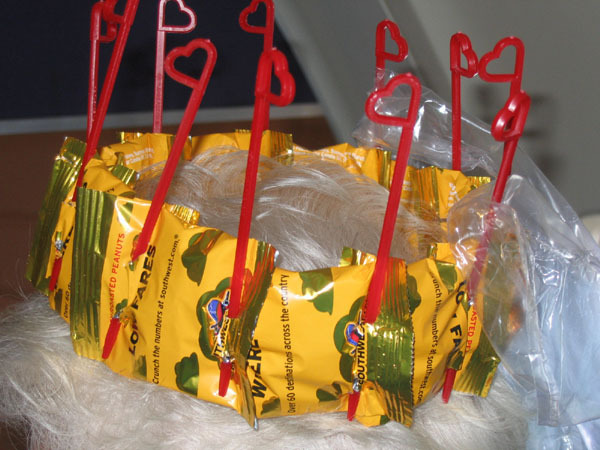 It was made of swizzle sticks and peanut packages with a plastic-bag "veil"--very cute! As usual, I was staying at the the Candy Cane Inn. After checking in and unpacking, I got to the Disneyland Resort shortly after noon. The new Toy Story Midway Mania ride in Disney's California Adventure (DCA) was #1 on my to-do list, so I headed there first. I went on it three times in rapid succession, using the single-rider line. (I think the regular line was about 30-40 minutes long.) This is a very fun ride that features various traditional midway games (ring toss, breaking plates, etc.) rendered in 3D computer graphics in scenes based on characters from the "Toy Story" movies. By the way, the crowds were larger than I expected midweek this far before Easter, but I guess some schools are already on spring break. The situation wasn't too bad, but I heard comments during my visit from locals as well as other out-of-towners that the parks were definitely more crowded than usual at this time of the year. I spent the rest of Wednesday afternoon puttering around DCA, including taking a couple of rides (again, using the single-rider line) on my favorite attraction, Soarin' Over California. One of my other stops was Blue Sky Cellar, a former wine-tasting room that now has drawings, models, and videos of upcoming attractions at California Adventure, which is undergoing a major overhaul. Well worth a visit next time you're at DCA. There are some exciting attractions on the drawing boards. 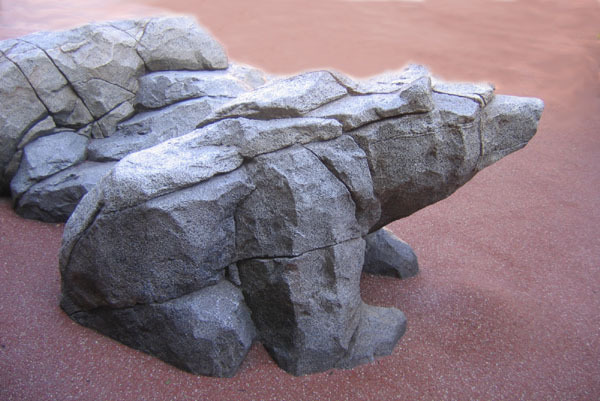 The adorable "granite" bear cubs shown below are near the Rock Slide in the Redwood Creek Challenge Trail area of DCA. (I had to wait a bit to get photos when there weren't kids clambering over them. :-)) I hadn't noticed these bears on my one or two previous visits to RCCT. The white stripes are exactly the sort of feature (known as a dike) that you often see in granite formations in the Sierra Nevada range. 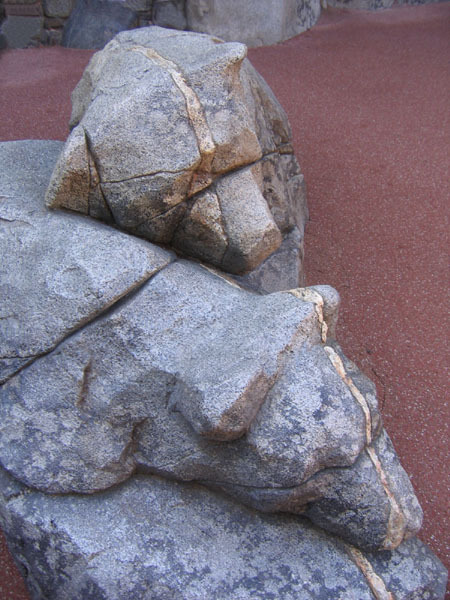 I have photos from Yosemite that show granite just like this. So kudos to the Disney folks for their accuracy--even in a children's playground. The third photo is a pretty pink tree that was near a cave in RCCT. By the way, if you've never been through the Redwood Creek Challenge Trail area, do visit it next time you're at California Adventure, even if you don't have kids. 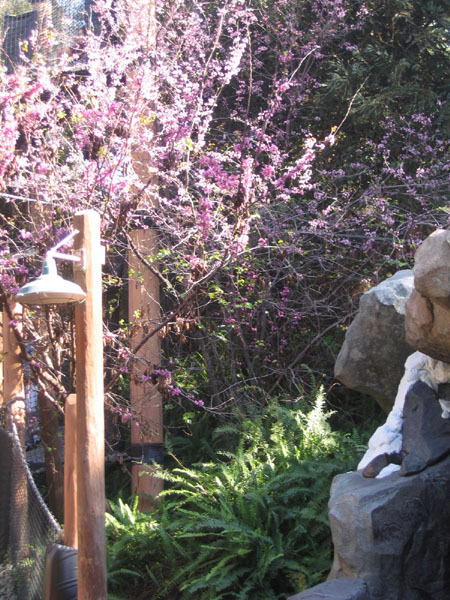 The theming alone--redwood trees, waterfalls, beautiful flowers, realistic ranger stations with old maps and brochures and radios--makes it worth a leisurely stroll. 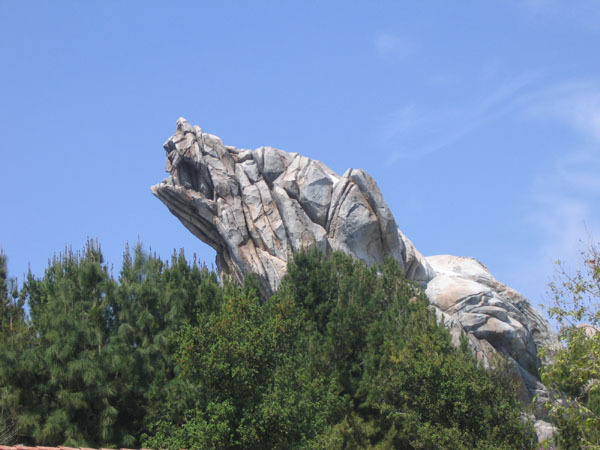 I had a FastPass for Grizzly River Run, but unfortunately, it broke down shortly before my FP return time. I checked back a couple more times before my scheduled meet-up with Larry, who was coming over after work, but no luck. The two of us met at Toy Story Midway Mania and went on that again, then I helped Larry find a new waypoint for his DCA virtual geocache. He needed a replacement for a waypoint that is now behind construction walls. We got some dinner at Taste Pilot's Grill, then made the long trek over to Disneyland. (For those of you who are familiar with the park-to-park distances only at Walt Disney World: that's a joke! It takes about 30 seconds to walk from one park entrance to the other.) We did the newly reopened and updated castle walkthrough and the recently revised It's a Small World ride, which now has some tastefully done Disney characters. After a couple of hours puttering around Disneyland, Larry headed home and I returned to the Candy Cane Inn, where I watched the evening fireworks from Disneyland before going to bed. On Thursday, Larry took the whole day off from work. (It's good to be the boss. :-)) He and I met up just before Disneyland opened, and headed straight for the Finding Nemo Submarine Voyage. I had only been on the subs once since they reopened with their new Nemo theming a couple of years ago. After we did the real ride, we asked whether we could try the Marine Observation Outpost, which simulates the ride for people in wheelchairs, those subject to claustrophobia, and others who can't go on the subs themselves. Larry knows someone who has been reluctant to go on the subs, and wanted to see what the alternative experience was like. We both thought it was very good; the film is almost identical to the actual ride. While we were in the queue for the subs, Larry reminded me about a benchmark that was hidden during reconstruction of the submarine ride, then subsequently hard to find under the hours-long lines that were in the area for the first few months after the ride reopened. Nowadays, the queue doesn't often extend out this far, so the mark is usually easy to find. It's just in front of my left foot in the photo at left. After we left the subs, we meandered toward DCA to meet up with the Rushings. 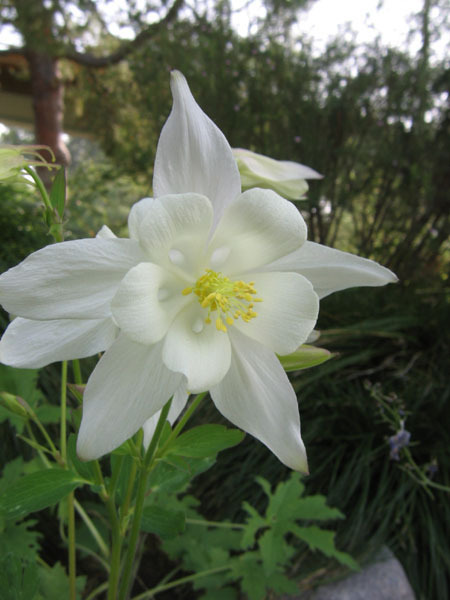 On our way out, we stopped several times to take photos of the beautiful flowers and flowering trees in Disneyland, such as these columbines near the Matterhorn. 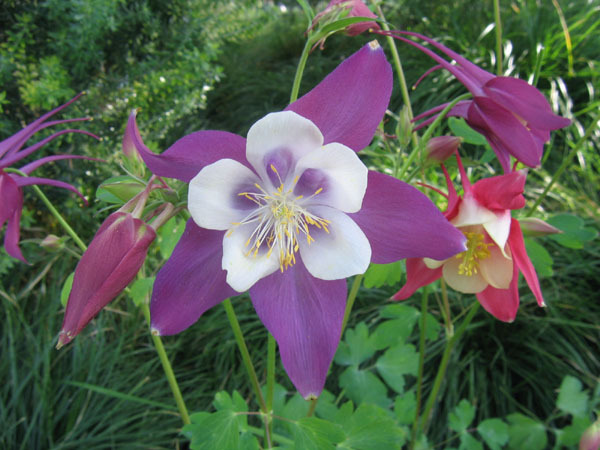 I love columbines! 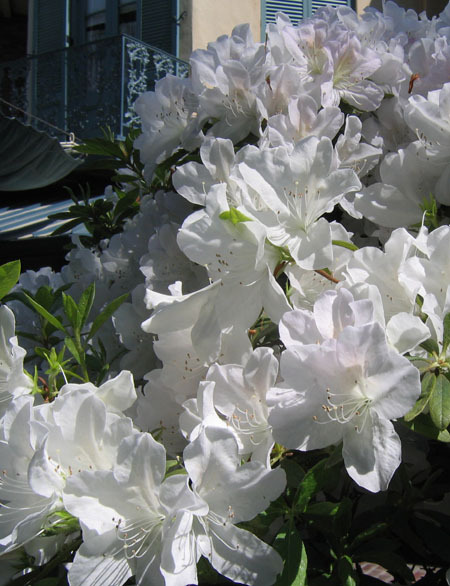 They have such a striking shape. I didn't see any along Highway 49 in DCA this year, so I was happy when I found these in Disneyland. 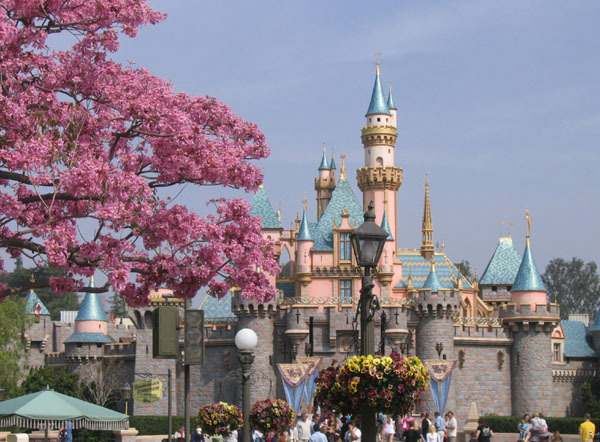 I also took another photo (as I did two years ago) of the beautiful tabebuia trees framing Sleeping Beauty Castle. On Larry's recommendation, we had lunch at Bountiful Valley Farmers Market, where I had a tasty chicken wrap. While Larry and the Rushings sat at a picnic table discussing their new GPS receiver, I walked around the area taking some photos of Grizzly Peak, which I'm always looking for new angles on. I then convinced everyone to go on Heimlich's Chew Chew Train. With Larry's help, we also found the one four-leafed clover towering over us in Flik's Fun Fair, the kiddie area of DCA. After lunch and a ride on Soarin' (using some FastPasses we had picked up earlier), I left the others to go back to the Candy Cane and rest in my room for a couple of hours. I met up with them again (along with Larry's wife and a friend of hers) for dinner at Ralph Brennan's Jazz Kitchen in Downtown Disney. Overall, our meals were very nice, aside from a couple of glitches such as one entree having to be sent back twice because it wasn't hot. After dinner, the core four of us returned to Disneyland, where we went on the Jungle Cruise, Pirates of the Caribbean, and the Haunted Mansion. After I noted how much fun it was to go on the Jungle Cruise at night, Larry quipped that the Blue Bayou and Pirates are better at night, too. That turned into a running joke about the indoor rides. Larry tipped us off to a great place to watch the fireworks: on the bridge over the entrance to Pirates. We got there only a few minutes before the fireworks started, yet found a place easily. You don't see the film projections on the castle, of course, but they do pipe the audio into the Rivers of America speaker system, so all in all, it's an excellent viewing spot. After the fireworks, Larry headed home, and Bill and Rhonda and I took the shuttle bus back to the Candy Cane. The next day, we three out-of-towners had several hours to play around the parks before we had to leave Anaheim. Again, we meandered around doing some rides (Star Tours, Alice in Wonderland, etc.) and taking photos. As we were waiting in line for The Many Adventures of Winnie the Pooh, I really enjoyed the landscaping of ferns along with azaleas, abutilons, and other beautiful flowers. 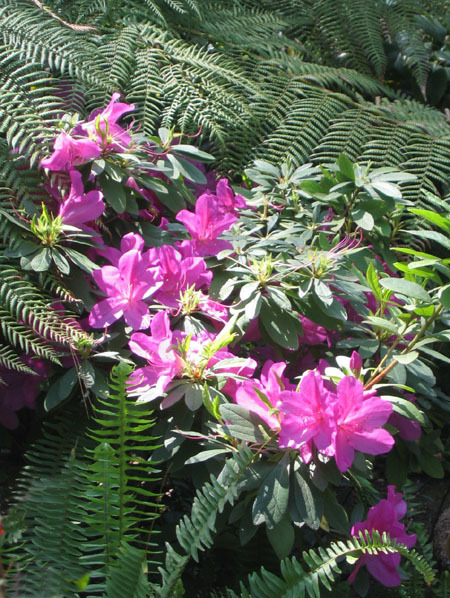 The pink azaleas and ferns above are in that area. 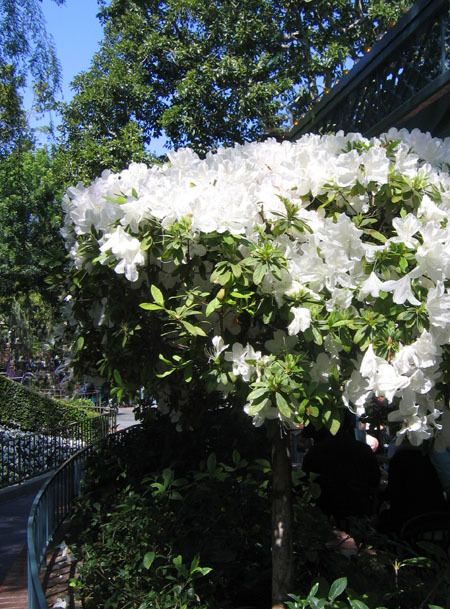 We also found some beautiful standard-form (tree-shaped) white azaleas near the New Orleans Square railroad station. I'm sure we aren't the only people who appreciate the efforts of Disneyland's gardeners in providing such a beautiful visual experience. I left mid-afternoon Friday and caught a shuttle bus back to Orange County airport for the trip home. As usual, the Southwest flight attendants had some memorable quips, including, "Tug your seat belt and hug your sweetie: this Boeing is going! 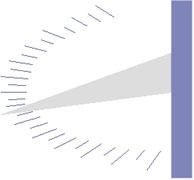 Prepare for departure." Even the pilot got into the act, noting, "Thank you for joining us on our flight to San Jose--and we do know the way." Indeed he did! 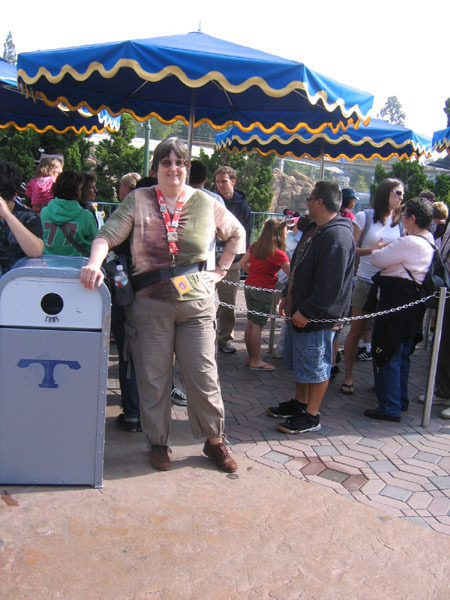 So I got home safe and sound, with another delightful Disneyland trip in my memories. Text and photos (c) 2009 Patricia F. Winter, unless otherwise noted.